U.S. employers reported 6.7 million job openings in June, up 0.4% from May, but lower than the record 6.8 million in April. According to data from the Bureau of Labor Statistics, the number of job openings continued to exceed the number of unemployed workers nationwide for the fourth month in a row. The quits rate, a measure of worker confidence, remained at the highest level in 17 years. Quits fell in educational services but had little change in all four regions of the U.S.
American consumers borrowed less than analysts expected in June. The Federal Reserve said total outstanding consumer credit rose by $10.2 billion during the month, compared with $24.3 billion in May. The increase was led by non-revolving debt which includes federal government holdings of student loans and auto financing. 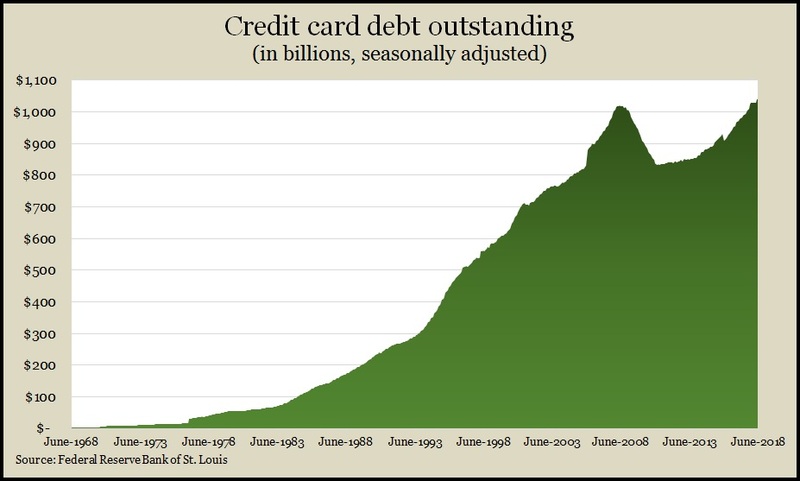 Revolving credit card debt declined slightly at an annual rate of 0.2%, following an 11.2% increase in May to a record level of nearly $1.04 trillion. It was only the second decline in credit card debt since December 2015, suggesting a pause in a longer trend of increasing credit card use to boost consumer spending, which drives the economy. July’s Producer Price Index was the first month without change since December. It was held back by a 0.5% decline in energy prices. Excluding energy, food and trade services, wholesale inflation rose 0.3%, the same as June, according to the Bureau of Labor Statistics. Year-to-year, the Producer Price Index rose 3.3%, down from 3.4% in June; the core PPI rose 2.8%. According to the Department of Commerce, wholesale inventories rose 0.1% while sales declined 0.1%. The inventories-to-sales ratio stayed even, remaining at the lowest level since late 2014, a sign that wholesalers have been trying to control balance between demand and supply. Year-to-year, inventories were up 5.1% while sales had risen 10.2%. The four-week moving average of initial unemployment claims fell for the fifth week in a row to 214,250, 40% below the 51-year average. The Labor Department report provided further evidence of a tight labor market in which employers are reluctant to let workers go, which should inspire more consumer spending. The Consumer Price Index grew 0.2% in July due to the rise in the cost of shelter, while energy prices fell 0.5%, according to the Bureau of Labor Statistics. The increase in headline inflation over the previous 12 months was 2.9%, unchanged from June, led by a 12.1% gain in energy prices. Core inflation rose 2.4%, the highest rate since September 2008 and the third consecutive rise in rate.